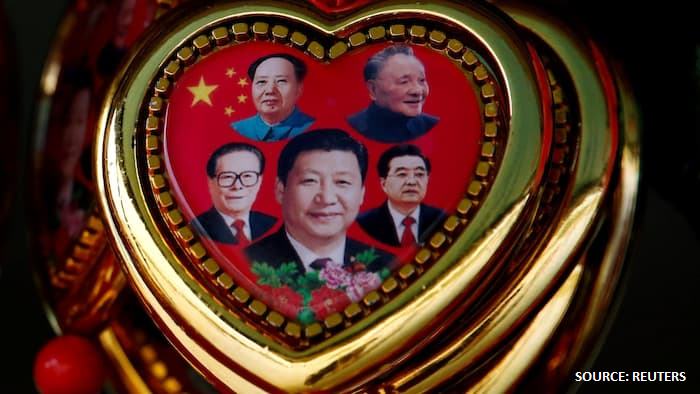 China’s economic policy has gone through 2 complete cycles since Chairman Mao’s death is 1976. Under new president Xi, it now seems to be about to start a 3rd cycle. If this cycle follows the pattern of the previous cycles, it will have very major implications for anyone doing business with China, either directly or indirectly. As yesterday’s post discussed, China’s lending programme since 2009 has been the largest in the world, at least $9.7tn – more than twice the US Federal Reserve’s. It now has to be substantially reduced, to avoid economic and political crisis. No country has ever been in this position before. But we do know what happened in China’s 2 previous economic and political crises, and these provide clear insight into how the new leadership will operate. Today’s post looks in detail at the first cycle, which ended with very similar problems to today’s. Deng returned after the death of Chairman Mao in 1976, following his 3rd purging. His first task was to deal with the chaos caused by the failed bid for power by Mao’s widow and the Gang of Four. As the photo shows, Beijing was then a very backward city. Deng, who had not travelled outside China since the 1920s, was astonished to find on visiting Japan and Europe/USA that China was decades behind them in technology and living standards. He moved quickly to improve the position, but faced entrenched resistance from those who believed that ‘combating bourgeois liberalism’ via political correctness, not ability, should remain the main criteria for official appointments. Major reform followed as Deng set out what became known as the philosophy of the ‘socialist market economy’, or ‘socialism with Chinese characteristics’. At the same time, Deng took bold steps in relation to the army, cutting its budget and manpower dramatically so as to free up cash to invest in the broader economy and boost living standards. As a former army general, he could see that the prospect of invasion, so feared by Mao, had become most unlikely, and he was able to push through his changes despite strong opposition. Deng began to set his retirement in motion around 1985, introducing the important reform of a maximum of 10-year terms of office for the senior leadership – a policy which still continues. But the collapse of the Soviet Union, and the Tiananmen Square protests in 1989, brought him back into a more active role. Hardliners in the government saw a chance to reverse Deng’s economic reforms, whilst clamping down on political protest. This prompted Deng to argue instead that the Russian Communist Party had lost power due to ‘too much glasnost (openness) and not enough perestroika (economic reform)”. The tour was at first unreported in official media, but as the blog will discuss tomorrow, new president Jiang Zemin was then able to consolidate his position on the basis of continuing Deng’s policies of economic reform. At the same time, he kept a tight lid on political protests which risked destabilising Communist Party rule. The years from 1985-92 were thus a period of considerable uncertainty for the future direction of economic policy. Deng’s reforms had led to major gains in living standards. But the privileges of the Special Economic Zones such as Shenzhen were being increasingly abused by corrupt leaders able to buy products and services at advantageous prices for their own personal profit. Equally, economic disaster was leading Party hardliners to demand a return to the ‘old ways’. The political turmoil of 1989 had provided the perfect excuse for those who had never supported reform. They demanded that the reforms should be reversed, on the basis that otherwise Communist Party rule was threatened. Tomorrow’s post will look at how Jiang adopted Deng’s playbook from 1977, and managed to create the springboard for China to embark on double-digit economic growth.